Ring Ivy Topiary. Let soil approach dryness between watering. Do not let roots sit in water.. Exposure: Bright, indirect light, Indoor Temp: 40 - 80 degrees F, Weight: 3.25 lb, Pot Size: 6.5 inches, Height: 18.5 inches. This ivy topiary comes in a plastic pot with no additional decor. Clay pot or mylar wrapping available for additional charge. Live topiary plants can brighten up a room and bring more color and a more verdant nature into it. Ring wreaths are the culmination of that idea. First, they have the most intense decorations of any topiary plant by tradition, so it is customary to see them covered in colorful ribbons and ornaments. 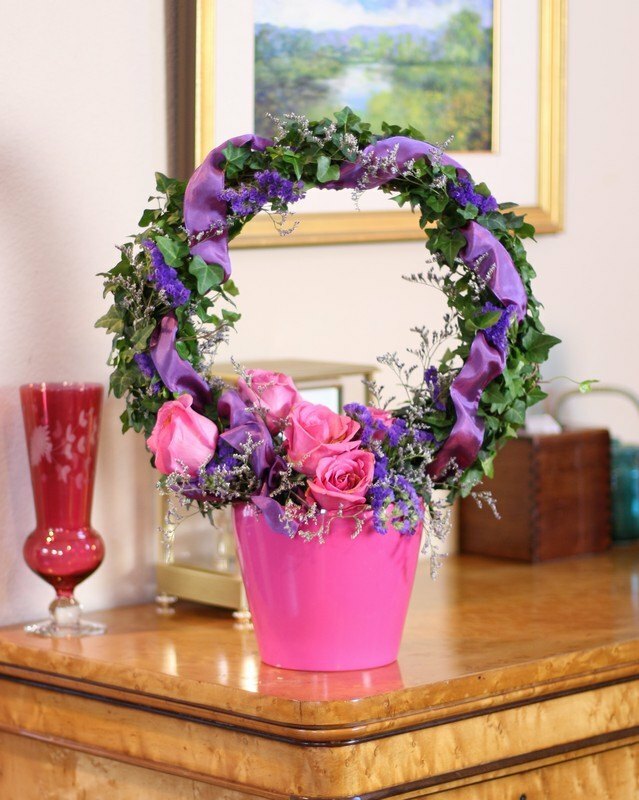 This dates back to the way ordinary wreaths are a major part of holidays like Christmas and Easter. Fresh topiary wreaths are just as much a part of that idea. Adding special decorations to them to match the seasons, or just to match your mood, is an enticing way to give them more life and ability to turn heads. The shape of the fresh topiary wreath alone will get attention, and when it is festooned with color that effect becomes more intense. Potentially, they could become the highlight of the entire room, which will make friends and family stop in admiration whenever they step in, and could potentially lead to many questions regarding its origin. Don't be afraid to let your imagination run wild when you have a topiary wreath. You can personalize it any way you please and change its appearance easily. Since the topiary trees are easy to customize, you should not feel limited by the constraints of the wreath itself. Additionally, you can decorate these wreaths any way you want, so it makes a good way to find the inner flair and creative side that lurks inside you! It makes a great table centerpiece when it has fresh, seasonal decorations that go along with the meal. This ring ivy topiary makes a great gift for a loved one - decorate it to add a personal touch! This idea also allows you to use your creativity, and sometimes that means a lot when giving a gift. Decorate with ribbon, bows, and flowers to take your topiary to the next level.